Montreal's jazz festival cancelled the show's run in July. MONTREAL — The artistic director of a Quebec theatre says he doesn't want to cancel a play that sparked protests and accusations of racial insensitivity that prompted the Montreal jazz festival to cancel the show's multi-night run in early July. The Saint-Jerome theatre will put on the show "SLAV" by Quebec director Robert Lepage in early 2019, David Laferriere said in an interview Tuesday. 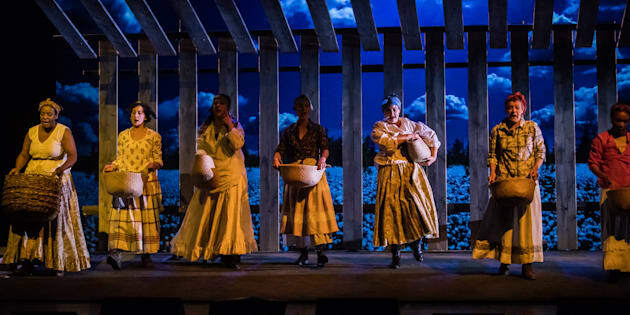 It features a predominantly white cast picking cotton and singing songs composed by black slaves. "Should white people in 2018 sing and celebrate slave songs, created by suffering and humiliation? It's not for me to say," Laferriere said. "I haven't finished my reflection on that and I don't think adding my voice to this debate is pertinent at the moment." Canadian playwright, actor, film director and stage director Robert Lepage, of Quebec City, speaks to reporters at the National Arts Centre in Ottawa on Nov. 10, 2010. The Gilles-Vigneault theatre in the town 60 kilometres north of Montreal is one of several venues scheduled to host SLAV next year. Tickets can still be purchased for dates in Sherbrooke, Drummondville and Saguenay, despite criticism from Montreal's black community, which accused the show's white creators of profiting off the pain of black people. One of the hottest tickets at this year's Montreal's jazz festival, the show was billed as a journey through "traditional Afro-American songs, from cotton fields to construction sites." Laferriere said he's empathetic with those who have criticized the play. "I am sensitive to their comments, to their suffering and opinions, I understand it very well," he said. "But ... the last thing for me to do is to kill this creation, and to not have this discussion." He said his theatre is considering ways to start a dialogue with citizens and hold activities around the play to raise awareness of the themes of the production. Laferriere said he isn't concerned about protesters disturbing the show. "Protesters need to be heard," he said. "Of course, in the logistics, we will have (protesters) in mind and will make sure things happen properly. As long as the public can enter the theatre respectfully, then I don't mind if there are protests." Dan Philip, president of the Black Coalition of Quebec, said the play's scheduled shows outside Montreal are an insult to black people. "It shows contempt for the black community and the black experience and slavery as a whole," said Philip. "It shows they will do anything for profit." "There are appropriate, respectful and ethical ways of producing the work and I supposed I was happy to hear the production had been cancelled (in Montreal)," said Armorer, whose theatre company is in its 48th season. "And that was diminished when I found out it was going to continue in its current form." He said the fact a play of this nature — created by a white man and featuring a predominantly white cast picking cotton on stage — can be performed in Quebec in 2018 shows "people don't really care."